Well, yesterday was productive. Secured everything a little more between the two houses. And I am still trying to get used to Matt and his family living with us. Having two small, very small, children around the house is way different than the solitude of walking in the desert at night and sleeping alone during the day. Matt and I had a long talk last night about everything. Seems as if his story is a little tougher and real stressful. 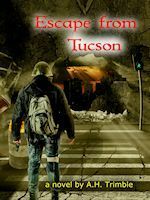 Matt was sure that first morning that the El Paso Electric generating station in El Paso had blown up and the power was out due to that. It wasn’t until about noon that he realized that his police scanner wasn’t working…and it ran off of batteries, independent of any electrical system. He didn’t have any spare batteries so he rationalized it was just dead batteries. A little later he decided he better check on Lisa. He had already tried to start his cars and none of them would start. He blew that off with no explanation. He was a good enough friend (my best friend) to check on Lisa. He hated my letter! He really thought I was over-reacting in my letter. He didn’t believe a word of it, but he was a little insulted that I would place more trust in the hands of the Hansen’s than him. But, he told me that in retrospect it made sense. He didn’t get dialed in until the next day as to what was really happening. With my letter I had included a list of things for him to buy or trade for. He always did keep a decent amount of cash laying around so he went to work the next day at the close-in stores acquiring some of the stuff on the list. Most of all he filled up his kiddie pool to the brim with water. Yeah, the utility water stayed on for the entire second day. That doesn’t really surprise me. While all of the power was knocked out there was still a whole bunch of water in the huge storage tanks around town. All of those tanks were located on elevations. Gravity kept the water flowing…until there was no more water in the tanks. Fortunately, Lisa, the Hansen’s, and Matt’s family were able to fill every possible container with water before it ran out. We had a couple of Water Bobs that Lisa filled up, we already had a couple of 30gal barrels filled up and stored outside. We had read an article AHTrimble.com about the water barrels and decorating them to look like outdoor furniture and plant stands. I liked the water storage, Lisa liked the decorating. It was a win-win. Any container that Lisa used that had no lid, she would put saran-wrap on. When that ran out she used wax paper, then aluminum foil. As she used the water she used the least stable containers first. We still haven’t used the water stored in the Water Bobs yet. She was thinking right! Once Matt got his head wrapped around what was happening he was a real gem, hardworking, relentless, and truly helpful. Them moving in with Lisa was a real godsend truth be told. I think it was only Matt’s continued presence that kept Ray at bay. And I will deal with Ray shortly. The most fascinating thing that Lisa shared with me happened the evening of the second day…the block party. Nobody had done much of anything the first day, mostly everyone stayed home and enjoyed their day off. It was the whole “shock” thing…Normalcy Bias at work. The second day people were coming out of their homes to get a break from the heat and socialize. Here in our neighborhood they decided to have a block party. There were all these neighbors with food in their freezers and no power to keep those freezers running. They got together and decided to have a big block party…at Ray’s insistence. They got their BBQ grills out, passed around charcoal to those who didn’t have any, and threw all the meat they had on the grills. Lisa said the smell was wonderful and she almost joined them, but she went over to the Hansen’s instead and they stayed indoors they whole time the partying was going on. Not that Jim didn’t use the food in his freezer, he just handled it differently. Their family sun-dried a lot of the meat, slow-smoked the rest of it. They wanted it preserved for use weeks and months later. Jim is smarter than he looks! Again, just after dark Ray, drunk again, shows up at the door and cussed at Lisa for not joining the party and sharing her meat. He said there was still time for her to “redeem herself” and just sneered at her. Sparky went ape on him barking and Ray told her to control her dog or he would shoot him. Lisa slammed the door in his face. But that only made things worse. For a lunatic bully like Ray…he only fears one thing…violence. The day after the block party is when people started to get worried that maybe this wasn’t a short-term event. I think they started looking at their food situation and got worried. Several people from the neighborhood headed to the local convenience store but all the food was gone. A drunk sleeping nearby told them the police had come by and taken it all…every last bit. The cops were riding horses, some were pulling little carts of some kind. He said they even took a bunch of cigarettes and liquor. The next day Ray, now the self-appointed neighborhood leader, held a meeting. They talked about forming an organization to take care of each other. Ray was voted the neighborhood “president” of all things. Just after dark that evening another knock on the door. Lisa thought it was Ray again so she had her AR in her hands when she answered the door. Nope, not Ray, it was the Sheriff’s deputy from down the street. He is a young guy, maybe late 20’s, nice wife, a young baby and a toddler. We’ve always waved to them, seen them in the store a couple of times, and always been real polite and nice to each other. I kind of liked him but he worked nights and we just never took the opportunity to socialize. Besides, they are like 30+ years younger than us. Anyways, he wanted to talk with Lisa. He said he had seen I wasn’t around and he was worried about her. He also wanted to share some important information. Lisa was smart enough to ask if Jim could join the conversation. Doug didn’t object, they went next door to Jim’s house. It caught Jim a little off-guard but he was friendly to Doug and they all went inside. The information Doug shared was more than important but it was also really disturbing. It scared the crap out of Lisa. Doug said that it was an EMP but no idea where it came from. Ft. Bliss had been hit by terrorists and as a result was on complete lock down, no one in or out. And he said there was significant trouble brewing in our town. Evidently the city police department was about to make a move and establish martial law. They approached they sheriff’s department. Doug and the rest of county deputies didn’t like the idea. Doug didn’t like the idea at all. The city PD was about to impose martial law…very strict martial law…based only on their self-appointed authority. Doug shared some of the details and none of it was any good. There was going to be a curfew, only if you had a pass issued by the police could you be out on the streets. Anyone caught without a pass would be arrested and imprisoned. That meant assigned to a “work detail” of some kind. The martial law was going to be touted as a “peace, security, safety, law and order” program. What really disturbed Lisa and Jim the most was the “tax” to be paid. Once every two weeks the police would come into each neighborhood to collect the tax. The tax would be food. According to the police the food would go to feed “less fortunate” people. Doug said that was pure BS, the food would be for the police themselves. In return the police were offering to keep everyone safe from the “bad guys” and any other criminal element. When Lisa was telling me about this it sounded like an extortion racket by some criminal gang. Doug said that some of the deputies and a couple of guys from the PD were going to stop this from happening. He warned Lisa and Jim to keep their heads down and to be careful, things were happening that really had him worried. So two days later Jim’s wife was fixing this huge pot of soup/stew. Lisa said it was a 5gal pot of stew. Lisa had given her some frozen –now thawed– packages of vegetables from the freezer to throw in the pot. There were two young families in the neighborhood with kids that said they were out of food, Hansen’s were going to feed them and others the soup/stew. Then the cops showed-up. They called everyone in the neighborhood out into the street. They outlined the new “safety program” and handed out sheets of paper with the rules printed on them. I thought to myself, where did they get the printing capability. So after the meeting was over Ray is talking to them off to the side. Before Jim’s wife could even walk back to the house they were at her door. Jim was talking to Lisa in our front yard when he saw them over there. He ran over but was stopped by this big, young cop putting a hand into his chest. An older sergeant told Jim’s wife that he needed to collect the tax from them first. Without a single argumentative word she agreed and asked him inside. He emerged about 5 minutes later with the pot of soup/stew and loaded it into the back of this little cart hitched to an older looking horse. Jim didn’t object either from what Lisa said. Turns out that was the strategy that Hansen’s had talked about. They figured something like this might be coming. Their plan was to act 100% compliant so they wouldn’t raise any suspicions or get “on someone’s radar.” She readily offered the pot of soup/stew explaining it was pretty much the last of the freezer contents. She even invited them to take the pot since they were out of food to cook. The cop never even said thank you. It was the worst possible scenario for cops gone bad. But, they suffered from karma in the end.